Yay! finally I'm home. So nice to be back to my own computer. I could kiss it. 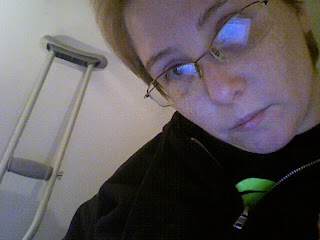 So that is my one crutch in the background, I tried to take a webcam shot of my foot but I couldn't angle the computer right without dropping it. So no foot shot. But then again no one wants to see my broken ugly foot anyway. So there should be some sort of regular scheduled blogging after tonight. Hell, it's about all I can do since I'll be stuck here in this apartment for the next few weeks. It took too much to get me up the stairs there is no way in hell I am going to try to go down them again with crutches. I will wait till I am fully walking before I attempt it. So life is what it is, and I never thought in a million years I would be glad to be back in this hellhole apartment but damn it Janet, there is no place like home even if it is this place.